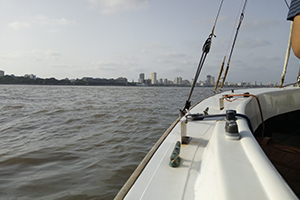 Sea Sailing At Gateway of India: My Very Own Dose of Vitamin SEA! It was a place she needed to visit to find herself. And taste the infinite salt on her lips. I was captivated by the above lines I had come across one day during an hour of leisurely reading. For me, the poem was all about freedom and the dissipation of oneself into nature. A lot of us dream of being just there – what with our stressed and overworked lives! Mumbai is an amalgamation of seven tiny islands brought together by smart engineering. One of the best examples in the city for me is the magnificent Gateway of India. Standing majestically over a backdrop of the blue sea, it teems with hundreds of people who visit the place. While some are busy gawking at the luxury of the Taj, others are busy licking ice cream cones or getting clicked by photographers promising a hard copy of the picture in a minute! Only a few succeed in observing the sea and its vastness. 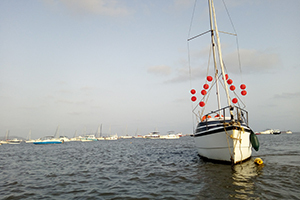 I had opted for one such sea sailing opportunity with Small Steps Adventures. 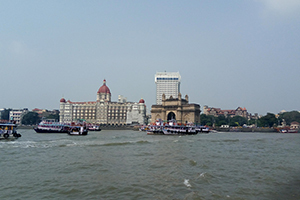 I was delighted to find that they organize a two-hour session on sea sailing near Gateway of India. The available time slots were plenty providing options both in the morning and evening which was very convenient. I had chosen an evening slot but ended up reaching much ahead of time. After observing the usual hustle and bustle at the Gateway, I decided to move a little away from the crowd and gaze at the Arabian Sea where boats of all kinds right from the dinghy fishing boats to the luxury yachts bobbed up and down. The sight made me imagine the sea as a ringmaster commanding an unflinching control of everything that tried to be a part of it. It was soon time for me to get back to the starting point where the Small Steps Adventure Team would be waiting for us. Though I was still pretty early for reporting, I was greeted by a team member who was patient enough to answer all my queries as we waited for others join us. The sea sailing session was to be conducted in an open boat (Wow!). A maximum of five people are accommodated in one sailboat which makes your whole experience pretty enjoyable and less cramped! Even children are allowed which makes this experience of sea sailing for the family quite exciting. Since I had participated solo, I was joined by two couples on the sailboat. We had a round of introduction with the team of Small Steps Adventures where all of us spoke a little about our backgrounds and passions. We received a set of instructions and were allowed to carry snacks brought from home or stalls. It was time for get-set-go and the sailboat set off with a spray of sea water. With the sail fluttering in the air coupled with the confident maneuvering of our very own Popeye, we left the city with a quick snap of the fingers. Now, there was time only for beauty and introspection. In no time, the couples got busy enjoying the romantic views offered by the sea and I was spared the awkwardness of being the kebab me haddi (Just kidding ;)). This just made me realize the importance of sea-sailing for couples and I made a mental note of passing on this information to all my committed friends! Our guide pointed out to an old looking lighthouse a little distance away. He said that it was known as the Dolphin Rock Lighthouse and was one of the only three lighthouses within the Mumbai harbour! It had been constructed in 1884 and is under the control of the Indian Navy today. It still emits a whitish-green light every night to help sailors. I promptly took some pictures of the lighthouse owing to its history while the couples were busy fighting for some serious selfie space to include the lighthouse in the background. The next place of interest was the Oyster Rock island also known as Middle Ground Island. This island too is under the command of the Indian Navy and is well protected. A guard of honor with a 21 gun salute is conducted every time the Admiral of the Fleet sets out in with the Naval Fleet. There was a sense of admiration in each one of us after hearing the story. The important sites had been covered and it was time to turn back towards habitation. The sun was about to set with its orangish pink hues reflected in the soft lapping waves. All I could hear during that time was the calm lull of sea water hitting the sailboat. It was so peaceful – the view, the gentle breeze on my face and the satisfaction of having witnessed the moment. The sea is a wonderful example of serenity at its best and rage at its worst. The Gateway soon appeared in the picturesque canvas and I knew it was time. That such an experience could be possible in a bustling city, I had no clue! We live on a blue planet that circles around a ball of fire, next to a moon that moves the sea . . . and you don’t believe in miracles?